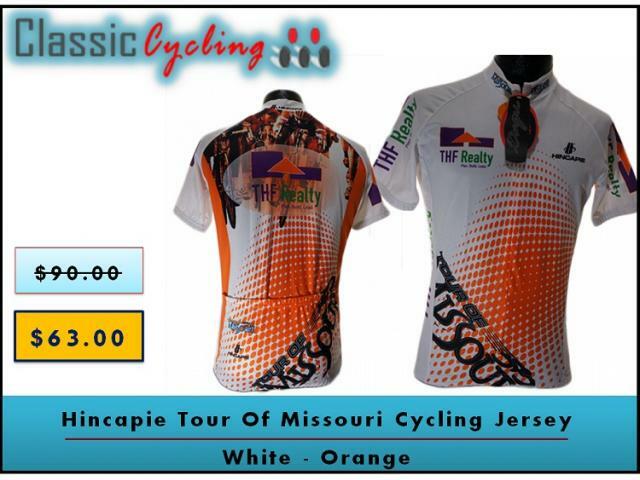 The orange & white Hincapie Tour Of Missouri Cycling Jersey comes with advanced fabric to keep you cool and protected from UV. Show your support of the Tour of Missouri King of the Mountains by wearing the same jersey on your own greuling climbs! This jersey was sponsored by Michelob Ultra. Hincapie Gel-Grip waist keeps the jersey in place and prevents it from riding up in the back for superior comfort. Sun Smart fiber construction provides a 30+ Ultraviolet Protection Factor to help protect the skin from the harmful effects of UVA and UVB radiation.